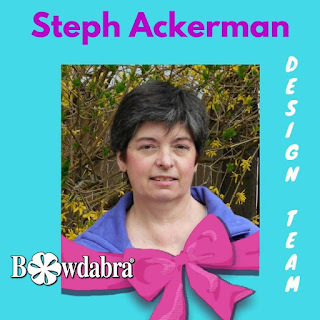 HI everyone, Steph Ackerman here today sharing how to create an easy Spring wreath with Bowdabra. Begin by placing Bow Wire in the Bowdabra and wrapping it underneath so it is out of your way while creating your bow. Starting with the 3″ wide ribbon, place it in the Bowdabra, leaving a 3″ length. Create a bow loop of the size of your choice and twist the ribbon while placing it back through the Bowdabra. Continue until you have 5 loops on either side of the Bowdabra. Next, select a coordinating 2″ wide ribbon. Create a loop and place in the Bowdabra. Twist the ribbon to create the next loop. Continue until you have 3 loops on either side, folding the last loop with the ribbon underneath so it does not show. Select some flower sprays and place in the channel. Use the left over Bow Wire to tie the bow to a grapevine wreath. If you enjoyed this quick and easy spring wreath tutorial you will find tons of tutorials, videos and more each week at Bowdabra blog. Be sure to click below to follow Bowdabra on Facebook. Each week on Monday at 4:00 p.m. PST and 7:00 p.m. EST, Bowdabra creator, Sandy Sandler will show you how to make several amazing projects with the Bowdabra on Facebook live! One lucky viewer will receive a surprise gift so don’t miss out! See you there!